The Tata Institute of Social Sciences (TISS) was established in 1936 as the Sir Dorabji Tata Graduate School of Social Work. In 1944, it was renamed as the Tata Institute of Social Sciences. The year 1964 was an important landmark in the history of the Institute, when it was declared Deemed to be a University under Section 3 of the University Grants Commission Act (UGC), 1956.Since its inception, the Vision of the TISS has been to be an institution of excellence in higher education that continually responds to changing social realities through the development and application of knowledge, towards creating a people-centred, ecologically sustainable and just society that promotes and protects dignity, equality, social justice and human rights for all. 1. 3+ years’ experience in PHP or any open source wen scripting language. 3. 2+ years’ experience in FOSS based web frameworks and CMS such as CakePHP, Joomla, Drupal etc. 4. 2+ years’ experience in MySQL/POstgreSQL database management. Graduates in IT/Computer Engineering or BSc in IT or Computers or Computer Science. Preferably with linux administration certification. Strong understanding and command of Apache, SSH(D), SAMBA, LDAP, Cyrus IMAP, Postfix, Dovecot, Round Cube administration and deployment, Strong understanding and command of Xen virtual machine. MCA with min. 50% aggregate in MCA or B.E./ B.Tech. (Computer science / IT) with min. 50% aggregate in B.E/B.Tech. Experience in working with free and open source softwares, practical work experience in a programming language (preferably python and java), databases (preferably postgreSQL and MySQL). Master’s Degree in Social Sciences, Management, Project Management, Information Technology, Communication, Journalism, Public Relations, or other related discipline or equivalent working experience in progressively responsible professional work in communication/information fields. 2-3 years of progressively responsible professional work experience in communication/information fields; Experienced in digital content and audience trends; Prior content strategy/management experience working with a national/global organization. Qualifications: The successful candidate should have Bachelor’s degree in Information Technology. Minimum one year of relevant work experience in server management, software development using FOSS, documentation, and also providing IT support to group which are working in more than one location. Soft Skills should include oral and written communication skills time management and organizational skills; and interpersonal skills. Fee: Application fees for Tata Institute of Social Sciences Recruitment 2015 is RS. 500/- (No applicati). 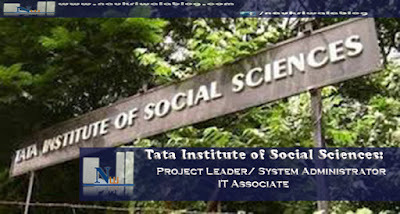 Interested and eligible candidates for Tata Institute of Social Sciences recruitment 2015 may apply online on link given below.